We have just returned from the most impressive trip we have ever taken: an inside look at Israel's security and their battle against terrorism! Our trip included briefings by top-level leaders from the Shin Bet, the Mossad, and the Israel Defense Force. This was all arranged by Shurat HaDin, the Israel Law Center. It included inspection tours to the Golan Heights, the Lebanese Border, the famed "Green Line," as well as the controversial withdrawal from Gaza. We were treated to insider briefings of Israel's Supreme Court as well as Israel's Military Courts. Conclusion: There is a pragmatic way to stop terrorism! 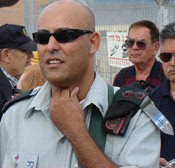 We were received by Col. Raanan Gissin.1 Since 2001, Gissin has been the Senior Advisor to Prime Minister Ariel Sharon. We were continually amazed throughout the trip by these high-ranking leaders who gave freely of their time to meet with us and speak candidly about their roles in meeting the security needs of Israel. We were hosted at the famed Tank Center at Latrun and saw several hundred different kinds of tanks on display! We were given a private briefing by Col. Ronni Shaked,2 former commander of Shin Bet (Israel's General Security Service, equivalent to our Secret Service). The topic of discussion was "the use of informants and analysis in counter terrorism." We also had discussions with undercover Palestinian agents who work with the Israeli security services to infiltrate the Palestinian Authority and even had a briefing by the senior interrogator of Shin Bet! At a special insider's tour of the Israel Defense Ministry Headquarters at HaKiria, Tel Aviv, we were briefed by the IDF on the Army's anticipated role in carrying out the controversial withdrawal plan in Gaza and its implications for Israel's security. We were given a guided tour of Israel's Supreme Court, which included a briefing by Supreme Court Chief Justice Aharon Barak3 himself, titled, "The legal and moralistic tensions between Israeli civil rights and security," which included informal discussions and dialogue. We spent one evening with one of the most distinguished Jerusalem Post investigative journalists, Khaled Abu Toameh. His talk was titled, "The inner workings of the Palestinian Authority"an objective view behind the terror." 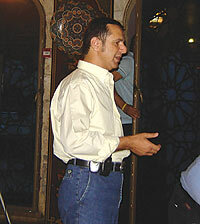 Khaled Abu Toameh has been one of Israel's leading investigative journalists for 20 years. He is an Israeli Arab, uniquely positioned to cover the Palestinian Authority for the Jerusalem Post and NBC News. He is also the producer of numerous TV documentaries and is a recognized expert on Palestinian and Israeli Arab issues. Our visit included a tour of the Har Ben Tal military position and observation point on the Syrian border, which overlooks the town of Quintera and the UN Buffer Zone. On the Lebanese border we had a tour of a military forward position and got a first-hand look at IDF surveillance units. Our group was personally escorted by the Senior Commander of the Northern Division and we were briefed on "the threat from the Hezbulla terrorist organization in South Lebanon." We toured the IDF checkpoint on the outskirts of Jenin in the West Bank, which guards one of the main terrorist infiltration routes to Israel. We also visited the controversial Security Fence and were briefed by the head of the IDF Humanitarian Unit on "the infiltration and detection of terrorists, explosives and smuggling, `humanitarian' problems with emergency medical vehicles and civil population." We visited the IDF Air Force Base at Hatzor, which conducts flight testing and secret evaluations of aircraft and weapons systems, and received a briefing by an Israeli Air Force Officer on "the role of the Air Force in defending the state and the continuing challenges to Israel's security." We were also treated to a F-15 Flight Simulator demonstration and a tour of the control tower during flight operations. We then toured Gush Katif, a Jewish community that is slated for dismantling and evacuation under the controversial withdrawal plan. We had lunch at Sderot, an Israeli city on the edge of Gaza under constant mortar and missile attack by Palestinian terrorists in Gaza. Our visit with the Southern Border Command also included a stop at the Border Police's special counter-terrorism unit dealing with infiltrations near Jerusalem. We also watched an exhibition by elite Israeli forces demonstrate their methods of surveillance, arrests and preventive self-defense against terrorists in Arab villages. We were also briefed by Jay Bushinski, known as the "Dean of the Correspondents." Bushinski formerly worked for the Chicago Daily News and was the former head of CNN (for five years). Jerusalem has the largest international press corps in the world - every news media in the entire world is represented. Jay reviewed with great candor the strengths and weaknesses of both the Israeli news media and the Palestinian Authority's. I was surprised to learn of an unintended impact of advanced communications technology on field reporting: the improvement of communications has now effectively hamstrung the correspondents in the field by "script control" direct from headquarters. We were then treated to a special briefing by a senior official of the Mossad. His session was called, "Tracking material support and resources of the Palestinian terrorist organizations." The best way to stop terrorism is to interdict and cut off their money supply. Nitsana Darshan-Leitner, Esq., Director of Shurat HaDin, Israel Law Center, gave us the primary insight of the entire mission: "Taking the battle against Palestinian terrorist organizations, their leaders and financial patrons to court." This pragmatic approach to stopping terrorism involves filing lawsuits on behalf of the victims and their families against the various organizations that fund and sponsor terrorism. The record of Shurat HaDin"in Europe and the U.S., as well as in Israel"is astounding and most promising. This moving briefing was simply a review of actual case studies and their prognoses for recovery. The opportunity is available, for all of us, to support this noble and pragmatically effective action against this despicable terrorism. Their efforts are supported by donations and we are encouraging all of our subscribers to pray about supporting them. Donations are tax deductible and can be addressed through our office. Avi and Nitsana Leitner, Directors of Shurat HaDin and friend. During 1998-1999 Col. Raanan Gissin was the senior public affairs and media advisor to Sharon (who was then foreign minister); he was a participant in the Wye Summit Conference and is a leading spokesman to the international community on security and strategic issues. Col. Ronni Shaked is an expert on extremist Islamic and Palestinian terror organizations and the appointed Arab affairs reporter for the Hebrew daily newspaper, Yediot Aharonot. 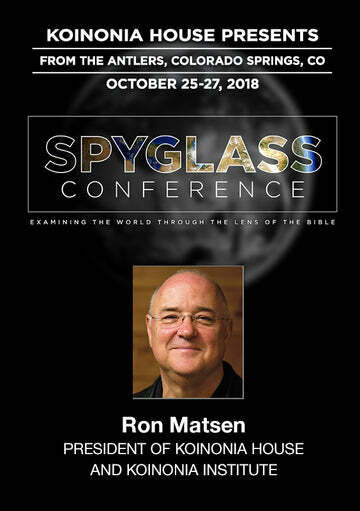 He gives lectures on Hamas and other terror movements in the Middle East and is called upon to be an expert witness in cases against Iran and the Palestinian Authority. Supreme Court Chief Justice Aharon Barak has been president of Israel's Supreme Court since 1978; formerly he was Israel's Attorney General. He has served as Dean of the Faculty of Law at the Hebrew University is the recipient of the Israel Prize in legal sciences. 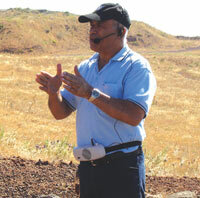 In the 1973 Yom Kippur War, Gen. Avigdor Kahalani served as commander of an armored battalion in the Golan Heights, whose decisive battles against incredible odds led to strategic victory. He received the Medal of Valor in the Yom Kippur War and the Distinguished Service Medal in the Six Day War. 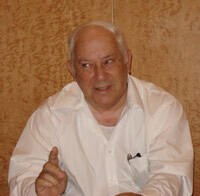 He also led The Third Way Party in the 1996 Knesset elections and was Minister of Public Security from 1996-1999.